Drinking Soda May Increase Your Blood Pressure : Shots - Health News People who drink more than one soda or other sugar-sweetened beverage a day have higher blood pressure, a new study finds. But diet soda may not be a guilt-free answer: Study participants who drank it had higher BMIs than their sugared-up counterparts. This shopper may be doing the right thing by driving his cart right by the soda display. 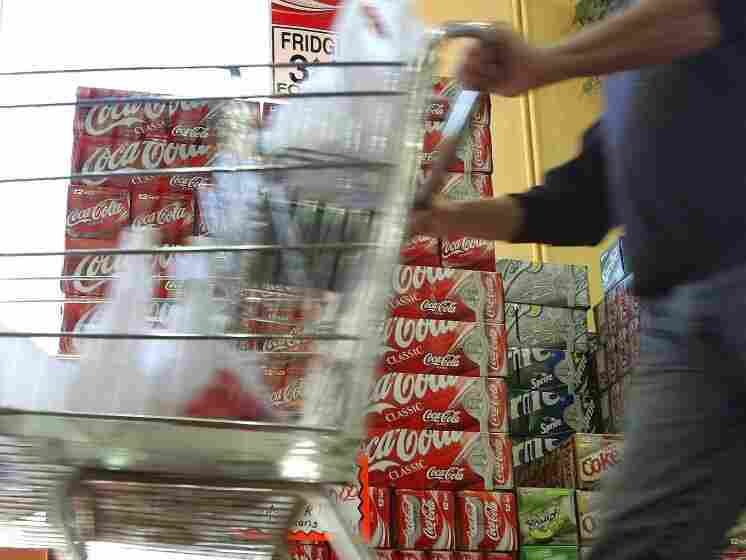 A new study adds yet another reason to consider scaling back your soda intake, and it's already putting beverage makers on the defensive. Researchers from the School of Public Health at Imperial College in London analyzed the diets of nearly 2,700 middle-aged people in the U.S. and the U.K. They found that people drinking more than one soda or other sugar-sweetened beverage a day had higher blood pressure, and that it kept going up the more they drank. After accounting for weight and other risk factors, that habit seemed to still put them at greater risk for cardiovascular problems. Now the American Beverage Association is warning people not to jump to conclusions. In a statement sent to Shots, ABA takes issue with the study for lumping in U.S. and U.K. sodas, which are made from different sweeteners. Research associate Ian Brown says that despite the difference, the blood pressure effects were the same across the pond. ABA says: "Regrettably, this study does nothing more than distract the public from widely accepted and clinically proven approaches to lowering the risk for hypertension and heart disease." You know, doing the boring stuff like diet and exercise. In the new study, the highest blood pressure levels were found in people who consumed both more glucose and fructose — the most common beverage sweeteners — and more salt. That may be because studies have shown that increased sugar consumption leads people to retain more salt, Brown says. "It's bad news for people who like chips and fizzy drinks," Brown jokes, adding that everything in moderation is OK. The researchers also found that people who drank more than one sugary drink a day consumed nearly 400 more calories than those who didn't. And their diets were more likely to lack key nutrients like potassium, magnesium and calcium. "This is because they're getting the calories from these nutrient-poor sources. All they provide is the calories — none of the benefits of real foods," Brown says. To get the results, the researchers relied on the participants to report what they ate and drank for four days in interviews with trained observers, and let researchers collect their urine and do blood pressure readings during two 24-hour cycles. The new study seems to bolster previous research showing that cutting back even just a serving of soda a day can help lower blood pressure for those most at risk. Still, the broader health questions raised have led to efforts to get soda out of schools, and many states to consider a soda tax. But don't sit there sanctimoniously thinking that your diet soda is going to save you. While the U.K. study showed that diet soda drinkers didn't seem to have the same high-blood pressure problems experienced by their sugared-up counterparts, they did have higher BMI. They also had lower levels of physical activity. And other studies have suggested diet soda is bad for your kidneys. The new study appears in the journal Hypertension.